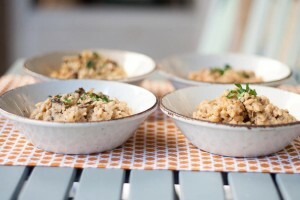 Mushroom risotto is an item that’s been on my ‘taste test list’ for awhile. Intrigued by all the ‘just add water’ risotto mixes that are available on grocery store shelves, I wondered if it’s really that much easier than making risotto from scratch. Risotto is actually not that difficult to make, but it does required constant stirring towards the end and has to be eaten right away. Unfortunately, risotto is not something that reheats well. For this taste test we bought two types of packaged mushroom risotto (President’s Choice and Uncle Ben’s) and will be putting them against a regular and healthier version of homemade risotto. Please try each type of risotto and comment on texture, appearance and flavour. Which one do you like the most? Would you choose a convenience version of risotto? I think that the homemade one will taste the best out of the ones that we test and that the healthier version might turn out okay too. 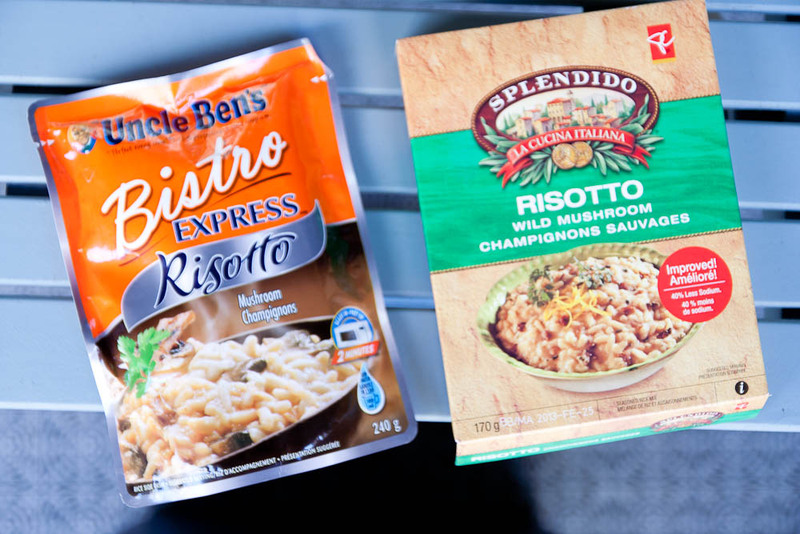 I think that the President’s Choice mushroom risotto will taste processed and salty and that Uncle Ben’s will have that off taste of parboiled rice that is characteristic of Uncle Ben’s rice. 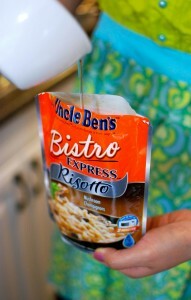 The Uncle Ben’s risotto was the easiest to prepare. Open the pouch, add water and place the pouch (it stands up) in the microwave and cook it on high for 2 minutes. That’s it! Microwaveable risotto that you cook in two minutes? It seemed sorta ghetto but I’m trying to keep an open mind. 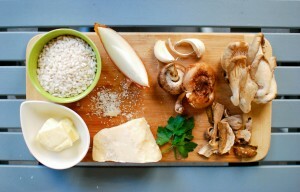 The PC Mushroom Risotto was also easy to prepare. You just have to follow the instructions on the back of the box (add the contents of the box to a pot of boiling water, let simmer until all the water is absorbed) and you actually end up with a pretty decent product. However, because the flavour comes from a seasoning pack mix you don’t see the actually pieces of mushroom that the homemade versions have. The overall appearance and texture wasn’t all that interesting but the taste was acceptable. While initially tasting the homemade risotto we realized that we needed to add more salt (we used salt-free chicken broth). We added a little salt while we were cooking (according to the recipe) but it wasn’t enough. It was actually interesting to note because I know that a lot of people blindly follow recipes and don’t think to taste and season as they go along. So for that reason the PC Risotto is a pretty good bet for a beginner/inexperienced cook. The last thing you want is to have a bland tasting risotto after constantly stirring at the stove for 20 minutes and thinking you did something wrong. However, once we had adequately seasoned the risotto it tasted just as flavourful as the PC instant version plus it was more visually appealing due to the pieces of mushroom and onion that you could actually see. It was more interesting from a texture and appearance standpoint. The healthier version tasted more bland in comparison (even after we added salt). This is most likely due to the fact that this version didn’t have any wine. The volatile properties of wine really allow it to carry flavours and they are more pronounced as a result. The healthier version was still acceptable but you would have to add some additional flavours (like more seasoning or more mushrooms) to kick the flavour up a notch. The Uncle Ben’s risotto was unevenly cooked and had that harsh parboiled rice taste indicative of Uncle Ben’s rice. I still don’t understand why people eat that stuff. I don’t think any rice (risotto or plane) should taste like that. In general, it’s always better to make the homemade version of things because you know exactly what’s in it and you can tweak the recipe to your liking. However, I do value convenience. If you want a quick and easy dinner (while saving time and effort) the President’s Choice Splendido Mushroom Risotto is the way to go (especially if you only want to make enough for two people). It can be hard to sauté such a small amount of mushrooms or find out what to do with the other 3/4 of an onion. However, you could make a bigger batch and use the leftover risotto to make arancinis the next day. If your schedule is busy and you will be eating out for most of the week, this is a great option for a simple meal that you can whip up without having to plan anything in advance. It’s also a great ‘starter’ risotto (the instructions are simple and it turns out well) whereas making risotto from scratch requires a number of additional steps which might be intimidating for a starter chef. It still takes time to cook however – approx 15 minutes. Which, interestingly enough is about the same amount of time that it takes to cook homemade risotto (except you are saving on the time it takes to wash, prep and cook the other ingredients – mushrooms, onion, garlic, grated cheese, etc). Some people would argue that it’s not that hard to prep the raw ingredients but this is also dependent on the skill and comfort level of the individual. So whether you choose to make risotto from scratch or from a box, both options are acceptable and it’s your decision whether doing the extra work is worth it or not depending on your situation. I am quite surprised however, that a packaged risotto mix would give the homemade version a run for it’s money. 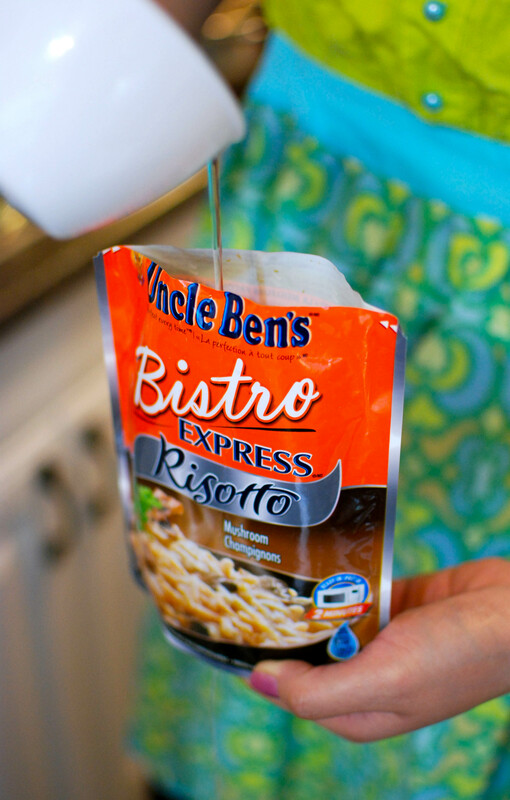 But you can forget about trying the Uncle Ben’s instant risotto that you cook in a microwave. That is one short cut that is definitely not worth taking. Blue: Watery, doesn’t look as appetizing as the other ones. I can’t see any traces of mushroom at all even though the package says ‘mushroom risotto’. It has that parboiled rice/chemically taste to it and some rice isn’t cooked all the way through. You have to really like Uncle Ben’s to like this one. Grey: Can’t see a lot of mushrooms in this one either but the taste is really good. The texture is even and al dente the whole way through. But the taste kinda reminds me of the Japanese noodle seasoning packet that comes with instant noodles. It’s also quite salty. Pink: This one tastes creamier than both of the other ones but it’s quite bland. Salt needs to be added to this one. It’s not as flavourful as the grey one. Purple: You can see the mushrooms in this one and the taste is more pronounced than the pink one. The texture is also good. For me, it’s a toss up between this one and the grey one. Blue: I can’t swallow you at all. You smell like plasticky smoke and I had to spit you out. You look weird and uneven, not risotto-like at all. You also seem to have unevenly cooked bits. Pass! Grey: You aren’t as interesting looking as the homemade versions, but you do have a balanced mushroom flavour and you’re evenly cooked which I highly appreciate. It’s too bad you’re waay too salty or else I’d eat you all up. Purple: You look a little mushy and overcooked and you really need salt. On the plus side, you have a nice creamy texture. Pink: I like you, you look the best! There are pretty bits of chewy mushroom plus all the rice looks nicely separated and glossy (probably due to the use of butter, which always wins my vote). Sadly, you desperately need to be seasoned with salt as the chicken broth that was used was salt-free. With some adjustment, you taste marvelous and you’re my favourite. Blue: Characteristic “Uncle Ben’s” smell: chemically! Industrial even comes to mind (Sorry, Uncle Ben). Aftertaste. And not a good one. Rice wasn’t all cooked. Must be due to the unevenness that comes with microwave cooking. Definitely PASS. Grey: Saucy, like it had brown gravy mixed in. Brown beef gravy! Taste reminded me of beef. Beefy! Rice texture was good, had a bite. Dull and very much brown/grey looking. Flavour not bad, but having tasted the others (after), seemed the most salty (maybe even a bit too much). Purple: Brightest in colour and most attractive looking. Glossy and appetizing, all the others were dull and brown/grey. This one glistened of goldenness 😉 The green of the parsley and the mushrooms added to this. Good bite. Even cheesy in flavour, which I liked. Pink: Sticky texture. Too sticky. Mushy. Overcooked perhaps? Bland, and a dull grey colour. Not that appetizing to look at. I didn’t like this one at all, much attributed to its texture. Blue: Chemical smell and aftertaste. Those are not characteristics I’m looking for in food! Smoky, and unevenly cooked. Risotto FAIL. Pink: Super creamy, and more flavourful than blue and grey! A bit overcooked, and still a bit flat tasting. Purple: Gorgeous glossy look, grains are separate and not mushed together, well- rounded flavour. Lovely! A Win!